Family-friendly places like Scuba & Snorkeling and Le Bois des Lutins will thrill your kids. Explore Marseille's surroundings by going to Hyeres (Parc Sainte-Claire & Sentier sous marin), Sentier Littoral (in Bandol) and Paroisse Cathédrale Saint Sauveur Aix-en-Provence (in Aix-en-Provence). There's lots more to do: take in the dramatic natural features at Calanques, browse the collection at Bibliotheque Municipale de Cassis, find your balance on the water with some of the best stand-up paddleboarding in the area, and contemplate in the serene atmosphere at Basilique Notre-Dame de la Garde. Make your Marseille itinerary with Inspirock to find out what to see and where to go. Sao Paulo, Brazil to Marseille is an approximately 19-hour flight. You can also do a combination of flight and train; or do a combination of bus and flight. The time zone changes from Brasilia Time to Central European Time, which is usually a 4 hour difference. Plan for slightly colder nights when traveling from Sao Paulo in May since evenings lows in Marseille dip to 14°C. Finish your sightseeing early on the 17th (Fri) to allow enough time to take a train to Avignon. Bring the kids along to Palais des Papes and Pont d'Avignon. Get out of town with these interesting Avignon side-trips: Nimes (Arenes de Nimes & La Maison Carree), Le Parc Alexis Gruss (in Piolenc) and Colline Saint-Eutrope (in Orange). There's still lots to do: get outside with Promenade a Cheval La Marisma, view the masterpieces at Tapiezo, identify plant and animal life at Le Parc Ornithologique de Pont de Gau, and take some stellar pictures from Le Sentier des Ocres. To find other places to visit, traveler tips, more things to do, and tourist information, use the Avignon sightseeing website . Traveling by train from Marseille to Avignon takes an hour. Alternatively, you can drive; or take a bus. Expect a daytime high around 27°C in May, and nighttime lows around 13°C. Wrap up your sightseeing on the 21st (Tue) to allow time to travel to Chasseneuil-du-Poitou. 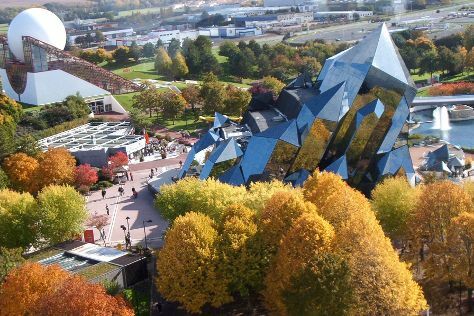 Kick off your visit on the 22nd (Wed): find something for the whole family at Futuroscope. To see other places to visit, photos, ratings, and other tourist information, read our Chasseneuil-du-Poitou online vacation maker . Getting from Avignon to Chasseneuil-du-Poitou by combination of train and flight takes about 5 hours. Other options: drive; or take a train. Plan for slightly colder temperatures traveling from Avignon in May, with highs in Chasseneuil-du-Poitou at 22°C and lows at 10°C. Wrap up your sightseeing on the 22nd (Wed) to allow time to drive to Sarlat-la-Caneda. Family-friendly places like Chateau de Castelnaud and Gouffre de Padirac will thrill your kids. Explore Sarlat-la-Caneda's surroundings by going to Le Bournat (in Le Bugue), Le Gouffre de Proumeyssac (in Audrix) and Kayaking & Canoeing (in Les Eyzies-de-Tayac-Sireuil). There's still lots to do: explore the galleries of Chateau des Milandes, take in nature's colorful creations at Les Jardins de Marqueyssac, steep yourself in history at Le Regourdou, and explore and take pictures at Les Noyeraies du Landers. To see reviews, more things to do, traveler tips, and more tourist information, refer to the Sarlat-la-Caneda tour builder . Getting from Chasseneuil-du-Poitou to Sarlat-la-Caneda by car takes about 3.5 hours. Other options: take a train; or take a bus. In May, daily temperatures in Sarlat-la-Caneda can reach 25°C, while at night they dip to 10°C. Finish up your sightseeing early on the 26th (Sun) so you can travel to La Croix-Valmer. La Croix-Valmer is a commune in the Var department in the Provence-Alpes-Côte d'Azur region in southeastern France.Geographythumb La Croix-Valmer is at the foot of the Massif des Maures hills in the Bay of Cavalaire-sur-Mer, halfway between Le Lavandou and Saint-Tropez.HistoryThe Emperor Constantine the Great, on the way to wage war against his brother-in-law Maxentius in 312 AD, is said to have had a vision of a cross in the sky stating "in hoc signo vinces" (by this sign you will conquer) at the location where La Croix-Valmer is now situated. Family-friendly places like Plage de Sylvabelle and Le Cap Lardier will thrill your kids. Venture out of the city with trips to Bormes-Les-Mimosas (Randonnee Bormes-les-Mimosas & Scuba & Snorkeling). There's still lots to do: tour the pleasant surroundings at Plage d'Heraclee, head outdoors with L'Observatoire Marin, contemplate the waterfront views at La calanque de la Cron, and kick back and relax at Plage de Vergeron. For ratings, traveler tips, maps, and tourist information, use the La Croix-Valmer trip itinerary builder app . Getting from Sarlat-la-Caneda to La Croix-Valmer by car takes about 7.5 hours. Other options: fly. In May in La Croix-Valmer, expect temperatures between 28°C during the day and 13°C at night. Wrap up your sightseeing on the 30th (Thu) to allow time to drive to Nice. Venture out of the city with trips to Cannes (Academie de L'Air & Lérins Islands). Spend the 31st (Fri) exploring the fascinating underwater world at Marineland. Next up on the itinerary: wander the streets of Vieille Ville, test your problem-solving skills at popular escape rooms, make a trip to Place Massena, and stop by Chocolatier Lacroix. To see reviews, photos, traveler tips, and other tourist information, refer to the Nice route planning tool . You can drive from La Croix-Valmer to Nice in 2 hours. 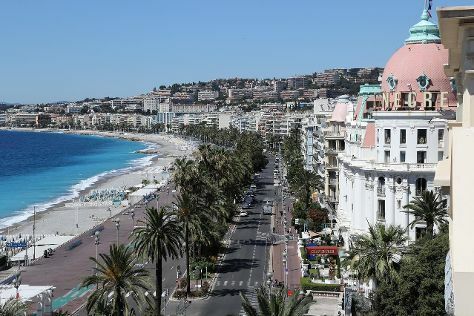 Traveling from La Croix-Valmer in May, you will find days in Nice are slightly colder (24°C), and nights are about the same (16°C). Wrap up your sightseeing by early afternoon on the 3rd (Mon) to allow enough time to travel back home.